So spring break is done and school is feeling like it’s winding down, but it’s not May, so you can’t totally check out (yet) and you still have to make lunches, check homework folders and pretend that the metric system is not only real, but also a good idea. So you may be feeling a little off and need something to help you look forward. May I suggest the triathlon? Please note: your child age for this race is the age they will be on 12/31/2019. Let that one mull around in your head for a minute, because it’s confusing. It’s their age on 12/31. Not their actual age right this second or on the race day. It’s their age in the future. The how: Training. I think it was Henry Ford that said “All things can be accomplished if you break them down into a series of small steps.” Or maybe he didn’t say that and I am just making it up. But the point is, there is training to help your child cross the finish line. That being said, for the younger kids, it isn’t really imperative. Most kids who are in decent shape can swim four laps, bike three miles, and run/walk a half a mile. They may not win, or place, or come any where in the vicinity of what adults would consider a respectable finish-but that’s not really the point. The point is to complete the race, and most kids can do that without training. There will also be a “transition” training session(going from swim to bike to run), at a time tbd. There is nothing like the feeling of accomplishment you get from completing something difficult. Most people go their whole lives never thinking, “you know what? I think I am going to do a triathlon.” And if you happen to think that thought, how many will actually train for one and then complete it? So these kids will have a huge mental advantage and the confidence and high that comes from knowing that they did it. Being nervous is a big deal for some kids. And sadly, life gives you lots of reasons to be nervous. SATS, college stuff, job interviews, love, marriage, kids, knee replacements- its all coming down the pipe. So this triathlon, is a great, fun way to learn to deal with this emotion. Because you are not trying to win. You win by finishing. You win by beating your own time from the year before. From seeing your own growth. Race day is so amazing, just another example of OFE love and heart. All these kids in their teal shirts running by and everyone cheering for all of them. This year, we have something really special. Mr. Casler. At the finish line. Putting the metals on all the kids. It’s inspiring. 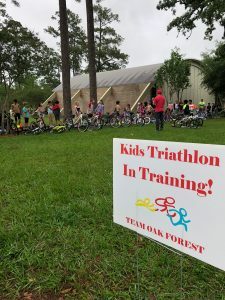 We’ve literally had parents so touched by their kids’ accomplishments that it has moved them to train and finish their own triathlon. And that’s pretty cool when you think about it. To be so motivated by your own child that you change your lifestyle and your fitness level. Kindergarten Annabelle did the triathlon. She didn’t train, she just did it. And well after her friend, kindergarten Sherwood, had finished the entire race, she still hadn’t finished the bike ride. We were starting to get worried, the way kinder parents can, especially when it comes to their first born. What if she fell? What if she got lost? What if she was hurt? Freak out!!! Panic!!! But I got a call form Sherwood’s mom. She had an Annabelle sighting. Annabelle was almost done with the bike ride and she was biking at a very leisurely clip, singing “let it go,” at the top of her lungs. Relief flooded through me but the tiger mom in me was annoyed. Why wasn’t she taking this seriously and trying? We finally saw her, coming up the finish line. She was cartwheeling. She cartwheeled across the finish line. Whatever feelings of annoyance I had were replaced by a flood of love and pride. We looked at each other and had one of those amazing married moments where you know what the other is thinking. “Whatever happens to Annabelle in life….” my husband said, “she will do just fine, ” I finished. She came in almost last place for her age group. But who cares? She finished and she had a great time and she did it her way. First place, last place-it doesn’t matter. They all won the minute they thought, “you know what? I can do this. I’m going to do this.” Our triers that never quit.